NEW to the retail sector are our innovative range of Dolce Gusto® Compatible* milkshake pods. 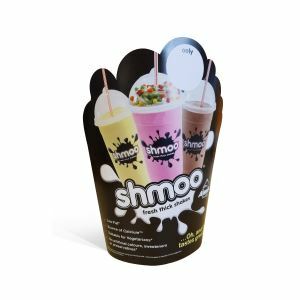 Shmoo has been revolutionising the UK foodservice market with ‘thickshake’ perfection since 1996. Today Shmoo is the No. 1 milkshake package available to UK caterers. 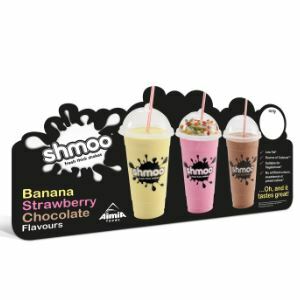 Blended with milk or ice Shmoo creates delicious thick, ice cream textured milkshakes and iced cappuccinos consistently and with ease. Presented in a contemporary cup with fantastic branding and domed lids, it gets you noticed on the street. Branding sells! There’s no washing up with Shmoo. It’s quick and easy to make. Just take one of our branded disposable cups, pour milk to the line, add a scoop of Shmoo, and mix using our unique in-cup mixer. …Oh and it tastes great! Those great cups we were talking about are FREE, so are the domed lids and straws! Buy a tub of Shmoo mix and get all your disposables FREE! 50% of the plastic used in the manufacturing process of our cups and lids comes from recycled plastic (RPET). Our cups and lids are 100% recyclable and can be recycled by all local authorities through plastic waste stream bins. Our straws are currently made from polypropylene, which can be disposed of in plastic recycling bins. However our goal is to replace these with a paper alternative in 2018, which is more environmentally friendly. Make it Fun with Toppings! Make more profit with fun extras. Toppings and squirty cream make your drinks look sophisticated and give them another dimension. Customers are more satisfied with their drink and you make more money as a result! 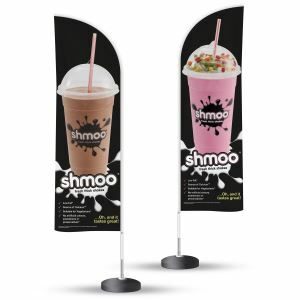 Get noticed with our Shmoo branded point of sale material. Free with every starter pack! Getting started with Shmoo is easy. The Shmoo starter kit includes everything you’ll need except for the milk! 3x 1.8kg tubs of Shmoo Ingredients, Strawberry, Chocolate and Banana approx. 300 servings. Approx. 300x clear branded Shmoo cups, lids, and straws. You choose the sizes: 13 floz / 22 floz. 3x tubs of different toppings. 4x aerosol cans of whipped cream. 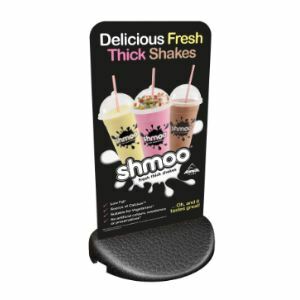 Point of sale material: Menu Board, Counter stand, large poster.